Alnwick ( /ˈænɪk/) is a market town in north Northumberland, England. The population at the 2011 Census was 8,116. Alnwick lies at 55°25′00″N 01°42′00″W﻿ / ﻿55.4166667, -1.7 (55.417, -1.700)1. The River Aln forms its unofficial northern boundary. Historically, the town was partly within the Bamburgh Ward and Coquetdale Ward and later included in the East Division of Coquetdale Ward in 1832. Alnwick's museum, Bailiffgate Museum, is close to the Bailiffgate entrance to the castle. Its collection is specifically dedicated to local social history. The museum has recently had a major refit funded by the Heritage Lottery Fund. Its collection includes a variety of agricultural objects, domestic items, railway items, coal mining artefacts, printing objects, a sizeable photographic collection, paintings and a range of activities for children. Local artist Stella Vine donated 3 of her paintings to the museum, as she had grown up in Alnwick. James Patterson, Australian Colonial Politician, Premier of Victoria, born in Alnwick in 1833. ^ "Parish population 2011". http://www.neighbourhood.statistics.gov.uk/dissemination/LeadKeyFigures.do?a=7&b=11119953&c=Alnwick&d=16&e=62&g=6452732&i=1001x1003x1032x1004&m=0&r=1&s=1435230378812&enc=1. Retrieved 25 June 2015. ^ (15 February 1968) "News and Views: A1 Alnwick by-pass". ^ George Tate, The History of the Borough, Castle, and Barony of Alnwick (Vol. 1). Alnwick: Henry Hunter Blair, 1866. ^ "Alnwick ward population 2011". http://www.ukcensusdata.com/alnwick-e05008018#sthash.lEgMqxYJ.dpbs. Retrieved 25 June 2015. ^ , Retrieved 23 December 2008. 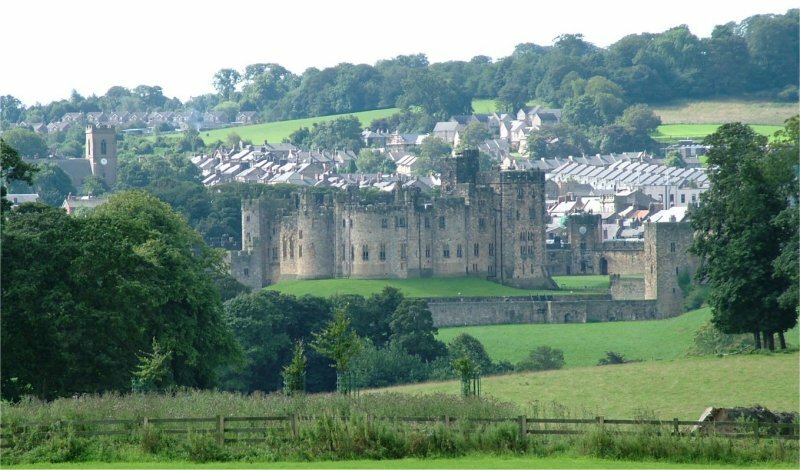 Wikivoyage has a travel guide for Alnwick. This page uses content from the English language Wikipedia. The original content was at Alnwick. The list of authors can be seen in the page history. As with this Familypedia wiki, the content of Wikipedia is available under the Creative Commons License.